I was giddy and honored to see that Amanda over at Sans Scrubs nominated me to participate in the Liebster Awards! What are the Liebster Awards, you ask? Well I certainly had that question as well (being a bit new to the blogosphere)! 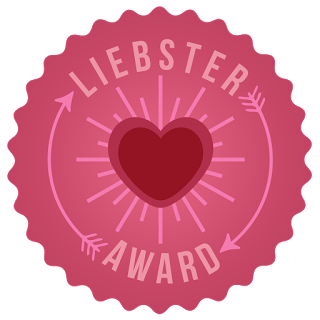 The Liebster Awards is a way of getting to know your blogger friends or meet new blogger friends - like a fun summer camp game around the campfire. Kumbaya! That aside, there are some rules (don't worry, they're fun) and then there are some questions! The questions I am answering below were provided to me by my nominator, Amanda. How fun is this? 1. What inspired you to start writing/blogging? I've been writing since I was in the 7th grade - I am talking full length novels! Yeah, I had no life. Then when I went to college and then started working, I wrote less and less and less. I hated it! I had written a blog before but it was more of a journal. I decided a couple months ago to start a new one in hopes to keep some type of writing in my life. I am loving it so far! Though I tend to blog about fashion, books, and food I make, it's a lifestyle blog, for sure. Neither, actually! I have a lot of energy naturally so I never needed coffee and I just don't like tea. It doesn't make sense to me. No thanks! The only hot beverage for me is apple cider or hot chocolate. 3. Name three guilty pleasure books and/or movies that you’re sorry you’re not sorry you like (say that three times fast). Hmmm good one! I don't know about books/movies but I do indulge in some reality TV shows when I am either sick or home alone before Cody gets home from work. He'll turn the TV on after dinner and yell out, "Why is the E!/Bravo/WE/Lifetime channel on my TV????" Oops! Sorry not sorry! 4. If you could change your name to anything, what would you change it to? I would love to have my middle name as my name. Drop the Sara, keep the Lily. My mother wanted to call me Lily but my dad loved Sara so they just merged them. In college and even now at work, folks call me Lily to differentiate me from other Sara(h)s. I'll answer to either! 5. What advice would you give your six-year-old self? OH LORDIE! I'd definitely tell her, "you won't understand this until you get to middle school/high school/college but just you wait, it gets SO MUCH BETTER after it is all out of the picture. Have faith." Because, f*ck yeah, it got SO MUCH better when I was out of all that school BS. On the lock screen, I have had a picture of my cat on it since June, when we had to put her to sleep. Definitely one of THE hardest things I had to do. 7. Are you a goal driven person or are you a process oriented person? That's a good one! I think I am more of a process oriented person. I love my rules, routines, and following directions. Cody LOVES to tease me by calling me a wet blanket but I just like to play it safe. 8. If you could go back to any age just for a week what age would you chose? Definitely a young age, like toddler range. I'd love to be that little, carefree, person. I could play, read books with my mother and sisters (we'd always bring our pillows into one of our beds, prop them up on the wall, sit with our legs all stretched out across the bed, and take turns reading books), and help my mom bake. Simpler times, for sure! Morning, totally! Once I am up, I am up! I love going into the office early and just diving into my work. So much so that usually I get it all done by the afternoon and then I start getting distracted by things like Facebook or BuzzFeed. Then by the time the sun starts setting, I am dying for my jammies and slippers! I can't pick just one! How cruel! I love music so much but I am a Bruce Springsteen gal at the center of it all. I think it's because the first time I saw him live, I was in my mom's belly! 11. If you could shrink any animal–real or mythical–so that it was pocket sized, what animal would you shrink and keep as a pet? I think a T-rex would be adorable pocket sized. It would become the opposite of what it was in real life - a threatening, frightening, and dangerous predator. Pocket sized, it'd just be ridiculous and adorable with it's tiny hands. I have size 9 feet - and I am only 5'2"! I know, it baffles me as well! I'm a DO-ER. I get it done. I don't waste time or put it off - I get it done and wipe my hands of it. In that same sense, I am such a control freak, it's not even funny. Christmas is my favorite holiday so it only makes sense that I'd fall in love with a Christmas baby. I am a creative soul. I used to draw when I was a kid but I sucked - I just had to find the creative outlets that I did rock at and those are definitely singing, writing, photography, baking, and fashion (heck yeah, my wardrobe counts as a creative outlet!). I love hosting parties but when the day comes, I get overwhelmed and wonder why I do it. It's definitely a catch 22. I am a cat person and despise dogs. Sorry! I just don't get it! I have a greek tortoise named Clarence and a bearded dragon named Steve. Mac and Cheese will always be my number 1 favorite food! I'm still fairly new to this blogging game so I think 11 nominations is a bit much for me at the moment. Here are 7, though! 3. What is your favorite karaoke jam? 5. If you could pick any occupation to start on Monday (different from what you do now), what would you pick? 6. Where would you go for your dream vacation and who would you take? 7. Do you have a favorite boy band/pop princess from the early 2000s? 8. What is your favorite holiday and why? 9. Do you have a mantra/motto/favorite quote and if so, what is it? 10. What are your plans for Friday night? 11. Are you an introvert or extrovert? So fun! I hope you all got to know a little about me and now I can't want to hear a little about the ladies above! Loved all of your responses! And thinking of tiny T-Rex hands being even tinier, HA! Thanks for being such a great blogging buddy! Glad you had fun with this!